This year marks the 50th anniversary of the launch of Mister Rogers’ Neighborhood, a children’s series that was broadcast on PBS stations for over 30 years. “Won’t You Be My Neighbor?”, a documentary about that series and its star, Fred Rogers, is currently showing in theaters nationwide. After watching it last week, this verse from Colossians has been much on my mind. Each episode of that show began with Mister Rogers taking off his jacket, donning a cardigan sweater, and replacing the dress shoes on his feet with a pair of sneakers. Some might say those articles of clothing were his trademark, but I would disagree. What defined Fred Rogers, what touched the hearts of all those who knew him, and what brought tears to the eyes of so many in that audience last week (none more than mine) was the kindness, humility, gentleness, patience, compassion and concern for children that were the genuine trademarks of his character. Although he was an ordained Presbyterian minister, he was no doubt constrained from presenting the Gospel on that program. But that did not prevent him from having an impact on millions of viewers, family members, fellow workers on the show, and even celebrities like Yo-Yo Ma. His son described him as like a “second Christ” in his life. With that statement, I don’t believe he was suggesting that his Dad was like a god to him. The world certainly does not need a second Christ – the one and only Christ is sufficient. But what we could use are more Christians who make Christ visible to a world in desperate need of him. 2 Corinthians 3:18 calls us to “reflect the Lord’s glory”. 1 Peter 3:15 says “Always be prepared to give an answer to everyone who asks you to give a reason for the hope that you have.” Implicit in that statement is an expectation that we live in such a way that our lives elicit those types of questions, creating powerful opportunities to witness. Never have those opportunities been as ripe as they are today. 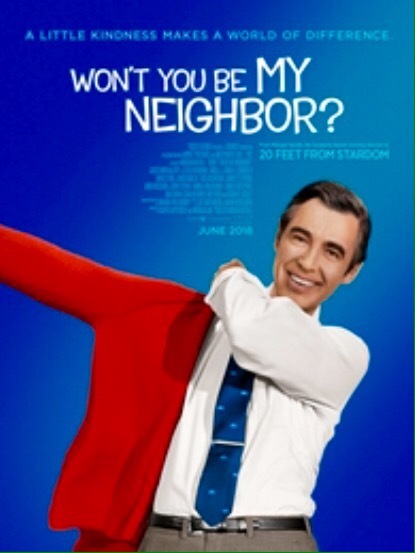 If “Won’t You Be My Neighbor?” is showing at a theater near you, do yourself a favor and go see it. You will not regret it. In fact, you may find yourself, like so many in the theater around me, not wanting to leave when it is over. It is absolutely my favorite movie so far this year.